The Econoline is Wolf's most economical illuminator. Features two 15 watt bulb illumination. 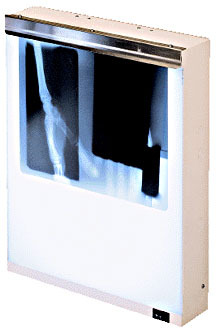 3½ inch depth cabinet with a baked on white enamel finish; a magic grip film retainer and a six foot line cord with a three prong plug. Ballast is 2 lamp, class P thermally protected 0.55 Amp, 120V, 60Hz, UL and CSA listed.